Limassol is truly the most lively and happening city in Cyprus. However, both families and exacting tourists will like this resort. In addition, Limassol is the most Russian-speaking city compared to other cities of Cyprus. Apart from beach-related rest, guests of the city can enjoy various entertainments (water parks, amusement parks, water sports). The main advantage of the resort is its close location to main island’s sights. Thus you can visit different parts of the island and see all its peculiarities, history and culture. The most comfortable way of travelling within the island is by rented car. To have an idea about the prices and book a suitable variant, visit a bookingcar.ru website, which has the best car rental deals only. If required, you can rent a car directly in the airport of Limassol. Thus, you will not be limited in moving within the resort and the island. By travelling by car, pay close attention to the traffic signs, as some sections of roads have speed limitations. If there are no such signs, means that in this area a standard speed limitation is valid (50 km/h within inhabited area, 80 km/h outside this area, 100 km/h for driving highways). To avoid any penalties, please observe the basic traffic laws. Don't forget to fasten a seat belt. If you travel with children, specify the necessity of a child safety seat by booking a car for rent in Cyprus. Pay special attention to the pedestrian crossings, because if you don't let a pedestrian cross, you will be fined for € 85. Observe rules of using the beep, as there are fines for their violation. Beep can be used during the daytime only. Using a cell phone, eating and drinking while driving is also prohibited. Foreign tourists often inadvertently run the territory of the pedestrian zones. This violation costs € 55. Pay close attention to the traffic signs, indicators and information plates, which can indicate parking ban or hours allowed for parking. Smoking in a vehicle in the presence of underage is also prohibited. This violation leads to € 85 fine. To pay for fuel, you will likely need a credit card, as most of the petrol stations are automatic and works at self-service principle. As for the fuel, there are no gas stations at all in Cyprus. You can fill your car with diesel engine, RON95 and RON98 petrol. Note that you mustn't take a full gas container going to a long trip. Diesel engine does not differ in cost from petrol, so you can disregard the engine type while choosing a car. There are no roads in Cyprus that must be paid for. You can travel within the territory of the island absolutely free. However, in some cities it's necessary to pay for entrance to the specified areas. Note these expenses when planning the travel's budget. 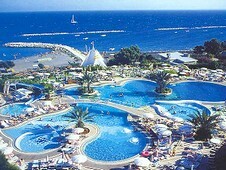 Larnaca from 17 eur a day.